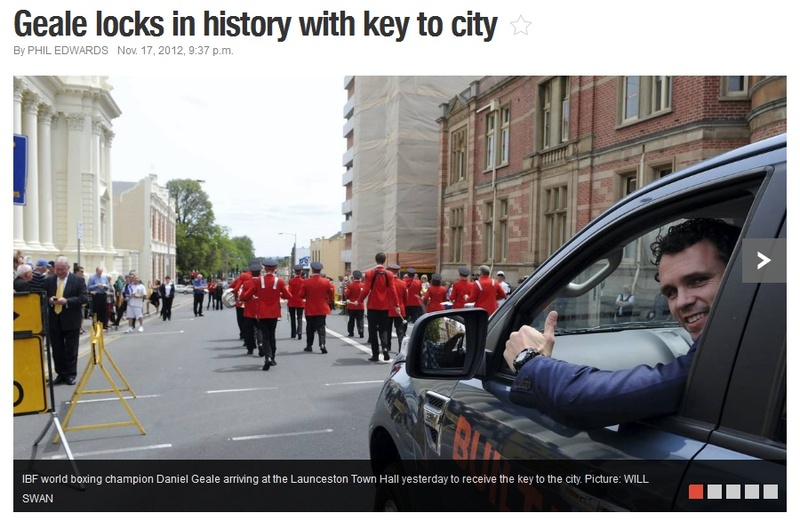 commented on "Geale locks in history with key to city ..."
LAUNCESTON honoured one of its favourite sons yesterday, bestowing the key to the city on IBF world boxing champion Daniel Geale. Geale, 31, is only the second Launceston citizen to receive the honour, joining round-the-world solo yachtsman Ken Gourlay. Geale was driven two blocks from the Brisbane Street Mall to the steps of the Town Hall yesterday, escorted by the City of Launceston Brass Band, where Launceston Mayor Albert van Zetten presented him with a commemorative plaque in a public ceremony. Geale's wife Sheena, children Bailey, Ariyelle and Lilyarna, his parents Wayne and Michelle and other family members and supporters were on hand to witness the civic presentation along with federal, state and local government representatives. ``We are here today to honour one of Launceston's and the world's finest, Daniel Geale, who has excelled in his chosen field of boxing,'' Alderman van Zetten said. ``Daniel's achievements cannot be overstated - his endeavour, his courage and determination are an example to us all to aspire to. Geale humbly thanked everyone present for the award which he described as ``a massive honour''. ``My journey has been challenging over the years . . . but we never gave up,'' Geale said. ``A lot of people didn't believe I was going to achieve anything but we knew deep down and especially back home in Launceston everyone was behind me and supported me throughout.